Cordless drills are very versatile tools and should not be missing from any workshop. Besides drilling, as the name implies, they are mostly used for driving screws ("electric screwdriver"). Here's a nice video about the internal mechanics of a typical drill! the drilling setting at the end of the scale should only be used for drilling, it creates way too much torque for screws and screwdriver bits! 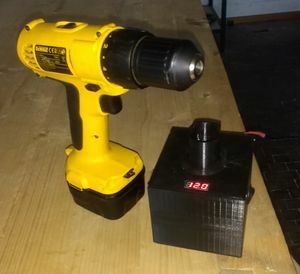 This drill got new batterys. Please be aware that the charger can be a bit confusing - green light means "not charging" - red light means "charging"
If there is no light, make sure the charger is plugged in and switched on. 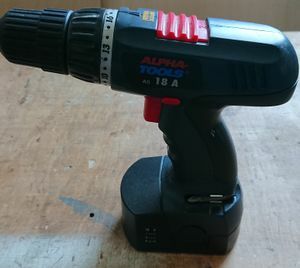 Ciaran's AlphaTools drill comes with two battery packs. 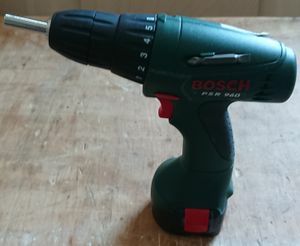 It has two speeds - only change when the drill has fully stopped! - and many torque settings. The charger can be a bit confusing - green light means "not charging" and you'll have to press the yellow button to start charging a battery! Lukas has a Bosch PSR 960 you might be able to use! Unfortunately, its battery has gotten pretty bad. It has six torque settings and only one speed. There used to be two batteries, but one was quite old and only held its charge for a very short time. It was therefore upgraded to a corded pack. Please do not leave the battery in the charger for more than 3 or 4 hours, the old NiCd batteries will heat up and suffer from quite the memory effect!